Oscar Pistorius has broken down in tears at court this morning as he begged for bail on the same day Reeva Steenkamp will be buried by her family. Oscar Pistorius, 26, was hidden under a blanket in the back of a police car as he was swept into the Pretoria courthouse where he was accused of gunning down model Reeva Steenkamp on Valentine’s Day. The Paralympic champion began to sob in the dock before he slumped forwards with his head in his hands as the prosecutor accused him of murdering an “unarmed and innocent woman”. The court was also told that Reeva Steenkamp had arrived at his home at around 6 p.m., with an overnight bag, before being “shot three times while on the toilet” in the middle of the night. 600 miles away in the coastal city of Port Elizabeth Reeva Steenkamp’s family, friends and loved-ones will be attending her private funeral. They have demanded to know why their “beautiful angel” was blasted to death with his 9mm gun and have begged the sprinter to “tell the truth” about the shooting when he appears in court today. Meanwhile olice focus their investigations on Reeva Steenkamp’s iPad amid concerns she received an early-hours message that may have sparked a row. 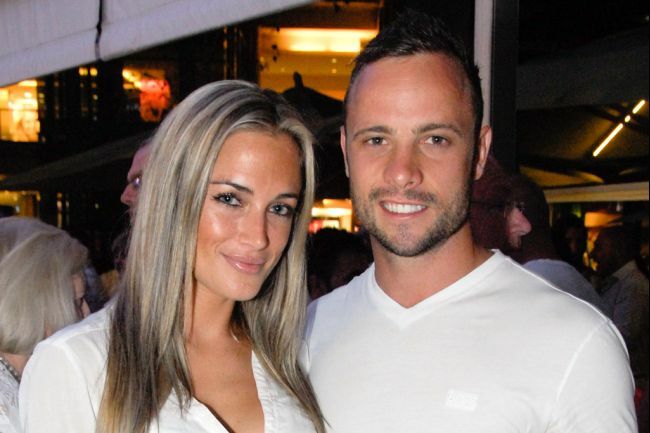 Reeva Steenkamp’s tablet computer was found on the bedroom floor – and this is now being checked by investigators along with both her and Oscar Pistorius’ phone for any clues about her death. But the mystery of her final moments deepened after the tragedy was recreated in a controversial “cartoon” strip in South Africa. The bizarre images suggest Reeva Steenkamp was shot in the hip in Oscar Pistorius’ bedroom before being attacked and seeking refuge in the bathroom, sitting on the toilet seat. Today it also emerged that sportswear brand Nike, one of the athlete’s main sponsors, has no plans to use Oscar Pistorius in future ad campaigns. This came as Reeva Steenkamp’s brother Adam called for the truth, telling reporters that the only person left alive who can say what happened is Oscar Pistorius. Adam Steenkamp, a 36-year-old father of two who works at the University of Cambridge, has flown back to his parent’s home in South Africa to help deal with the crisis. Though he is Reeva Steenkamp’s half brother, as they have different mothers, he said that they considered each other direct siblings.